A modern, magical twist on the Gothic Romance and Girl Detective genres, this book will appeal to fans of both Beautiful Creatures and the Mortal Instruments series. Reviewers have praised the take-charge heroine and the spellbinding romance. Kami Glass is in love with someone she's never met—a boy she's talked to in her head since she was born. This has made her an outsider in the sleepy English town of Sorry-in-the-Vale, but she has learned ways to turn that to her advantage. Her life seems to be in order, until disturbing events begin to occur. There has been screaming in the woods and the manor overlooking the town has lit up for the first time in 10 years. . . . The Lynburn family, who ruled the town a generation ago and who all left without warning, have returned. Now Kami can see that the town she has known and loved all her life is hiding a multitude of secrets—and a murderer. The key to it all just might be the boy in her head. The boy she thought was imaginary is real, and definitely and deliciously dangerous. SARAH REES BRENNAN was born and raised in Ireland by the sea. After college she lived briefly in New York and somehow survived in spite of her habit of hitching lifts in fire engines. Since then she has returned to Ireland to write and use as a home base for future adventures. Her Irish is still woeful, but she feels the books under the desk were worth it. "A sparkling, assured fantasy that will make you laugh and break your heart..."
"Readers will laugh, shiver, and maybe even swoon over this modern Gothic novel." "A darkly funny, deliciously thrilling Gothic. 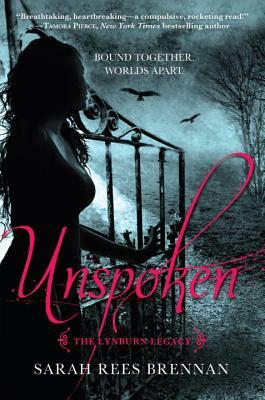 Unspoken kept me up late, turning the pages as fast as I could." "Witty, take-charge Kami reads a bit like a British Veronica Mars, and troubled Jared, uncovering his own dark legacy alongside her, is compelling. Brennan thoughtfully and thoroughly explores the implications of sharing a psychic connection; for Kami and Jared, it's by turns comforting, romantic, and agonizing. After this first installment-full of mystery, magic, and nods to both the girl detective genre and gothic romance-readers will be impatiently awaiting the next." "A promising launch with a dark cliff-hanger of an ending."